Daily trips to Alonnisos in the Sporades marine park. A unique experience which combines sailing, leisure,adventure and a BBQ meal on board to remember! Departure: 9h00 to Alonnisos & marine park islands. Skiathos once a week. Breakfast: coffee, tea, chocolate, bread, butter, Skopelos honey and orange and strawberry homemade marmalade. Lunch: BBQ ( chicken, pork and Skopelos sausages), salads and dessert, coffee and sweets. Local products. Beverages: bottled water, wine, raki, ouzo, espresso coffee. 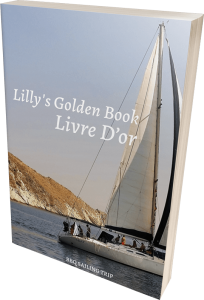 Will you also write your day memories on Lilly’ s golden book?